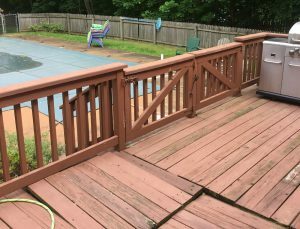 This rotting deck was warped, uneven and downright dangerous. 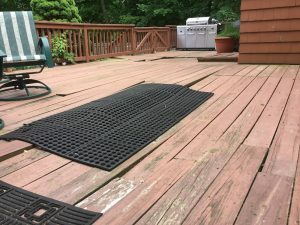 The Madison, NJ homeowners called us in to rebuild their rotting deck. 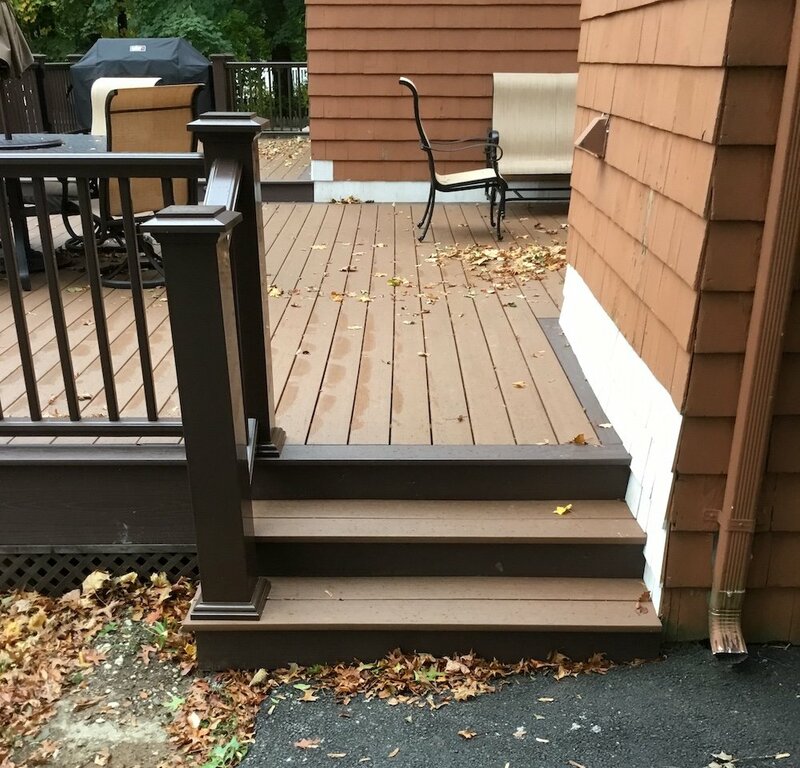 They opted to rebuild using wood composite material. This would prevent future rotting. Under the riser, lighting was added for safety. We also added wheels to the gate down to the pool. 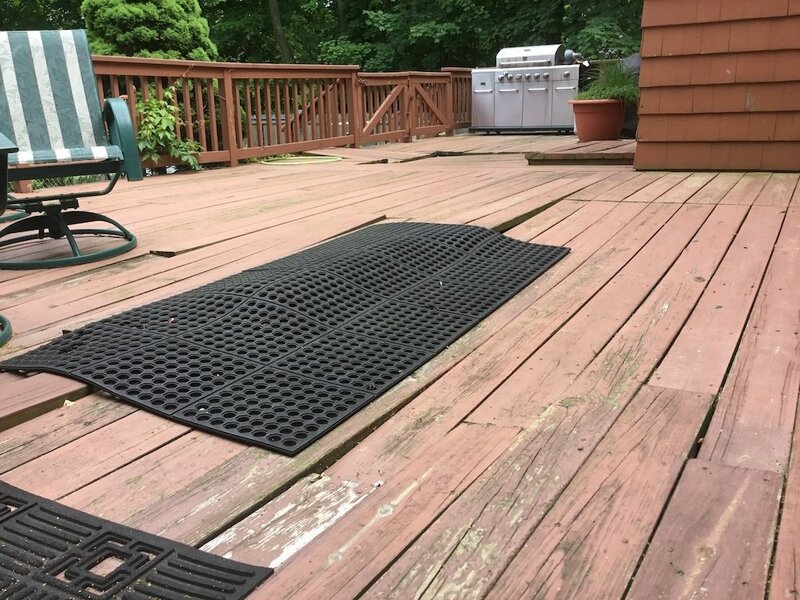 The wheels would allow the gate to open and close easily. These homeowners were living dangerously by having a large grill, planters and even a table and chairs out on their deck. 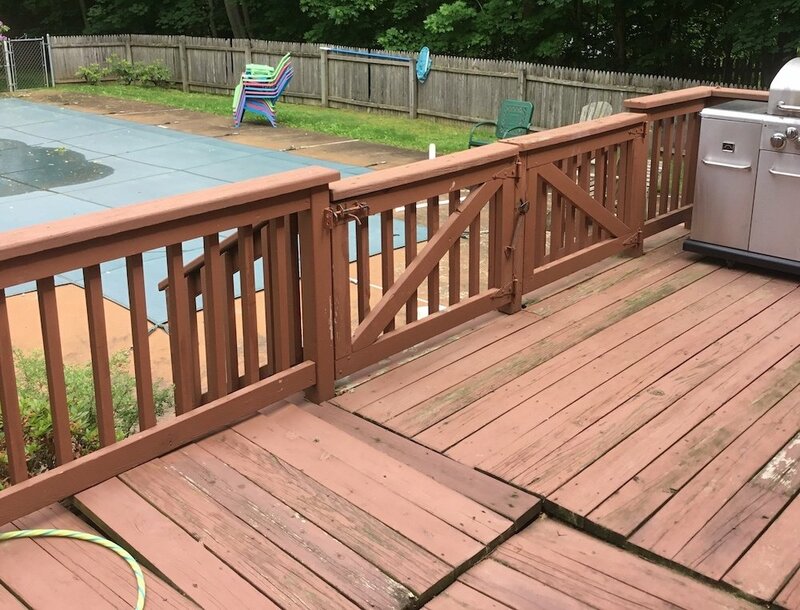 As is evident from the photos, the boards were warping and rotten. We were quite surprised that they were still making use of the precarious structure. After everything was removed, we began by demolishing the rotten railings and floorboards. Once the top of the deck had been removed, we could better examine the joists, beams, and posts. The posts were fine, but the rest of the frame needed to be reconstructed to be to code. The carpenters laid the new composite floorboards. 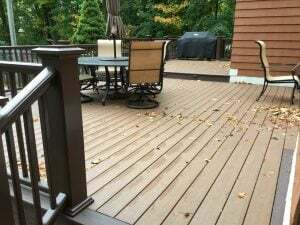 They created a two-level deck in order to best level the deck using the existing posts. In the single riser between the two levels, lighting was added. 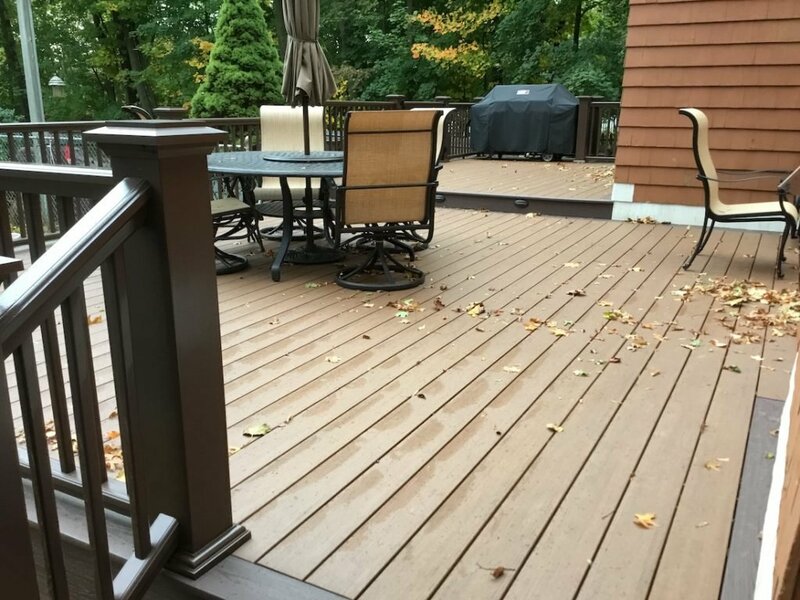 In addition to being a safety feature, it also adds nice ambient lighting to the deck in the evenings. 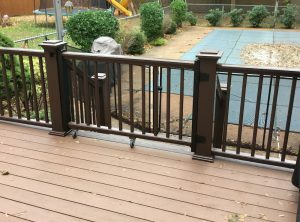 The carpenters then installed a new composite railing system. 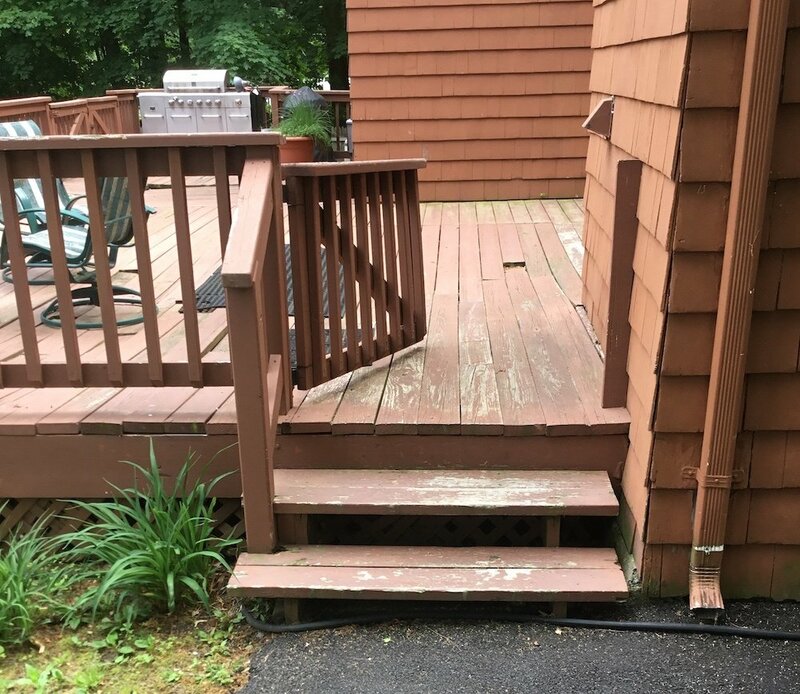 The side gate was removed and not replaced. The gate leading down to the pool was replaced. In addition, wheels were added to the gate for easy opening and closing. 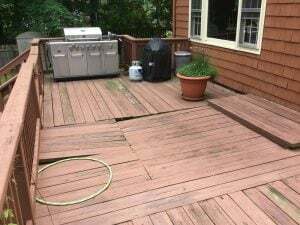 While we were there, we also replaced a number of rotted cedar shingles that butted up against the deck. These were primed to protect them. They will be painted to match the home in the spring. 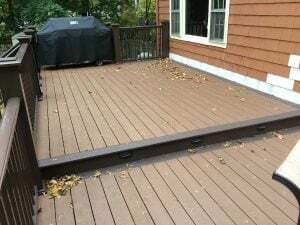 Now the homeowners can safely walk, sit, and grill on their beautiful new deck.